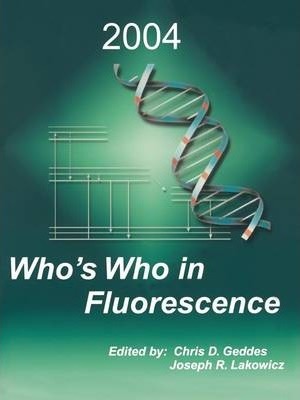 The Who's Who in Fluorescence 2003 volume was published in November 2002. It featured some 312 personal entries from fluorescence workers all over the world. Initially we were unsure how useful the volume would be. However, it wasn't very long before we were inundated with requests for both bulk and personal orders. In addition a significant number of copies were freely distributed at conference venues, such as at the Biophysical Society meeting in San Antonio. Texas, March 2003, and at the Methods and Applications of Fluorescence Spectroscopy conference (MAFS) in Prague, Czech Republic, August 2003, where these two venues probably host the largest gathering of Fluorescence workers anywhere. Even when we were initially taking e-mail based submissions, contributors were freely commenting on what a useful resource they saw the volume as being. We subsequently shared these comments on the back outside cover of the 2003 volume. As well as individual scientists supporting the 2003 volume, the Fluorescence based Companies also played a key role, where without their financial support, the volume probably would not have the impact it currently has.As such, the Who's Who in Fluorescence 2003 has been a much bigger success than we ever envisaged. Subsequently, we now present the Who's Who in Fluorescence 2004 volume. The new volume features 359 personal entries from 35 countries around the world. In addition we have increased company support, which should enable us to distribute more copies at targeted venues in 2004.